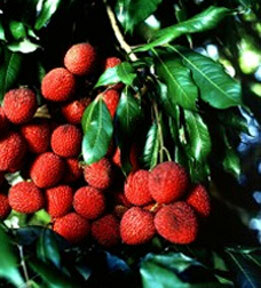 Lychees are a sweet edible fruit with rosy red skin and white, semi-translucent flesh which is tangy and juicy. This is a seedling grown plant from Kwai Mai Pink and the tree will bear fruit in about four years. The tree is also grown as an ornamental. Lychees are self-pollinating, producing both male and female flowers on the same panicle, so only one tree is needed to get fruit. To become productive trees however, they need a week of cool night temperatures (below 20?C) before flowering. Fruit do not improve in flavour after harvest, so should only be picked when fully coloured, about 100 days after flowering. Fruit are ready in the summer. Full sun. They can grow in a wide range of soil types (organic rich slightly acid is best) and need good drainage. Young trees need protection from frost and wind. Only fertilize at flowering and after harvest. They grow best in warm areas, with cool dry autumns and winters where the temperature stays above -4C. Lorikeets and fruit bats love the fruit, it's recommended that fruiting trees are netted. Insect pests are erinose mite (not damaging to fruit), macadamia nut borer and fruit spotting bug.